Annie Conde, a buyer for the MuseumStore, gets first dibs on items that don’t pass quality control, like this SFMOMA fog globe. 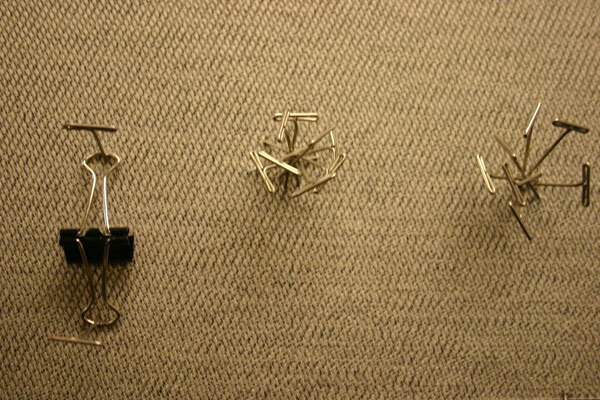 Andrew, the museum’s web production coordinator, created this homage to Matthew Barney’s DRAWING RESTRAINT: “Office Restraint”. 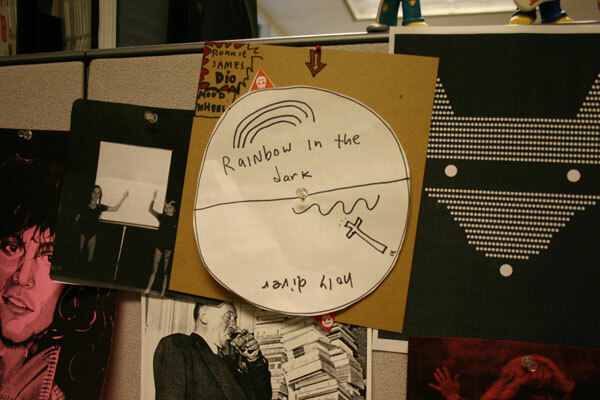 This Ronnie James Dio Mood Wheel is straight from the mind of Tammy Fortin, media arts assistant. The wheel lets you know whether you have been left on your own with no sign of morning coming or if you’ve been down too long in the midnight sea. Jessica Lynch, executive assistant to the finance director, sits in Tammy Fortin’s former workspace. 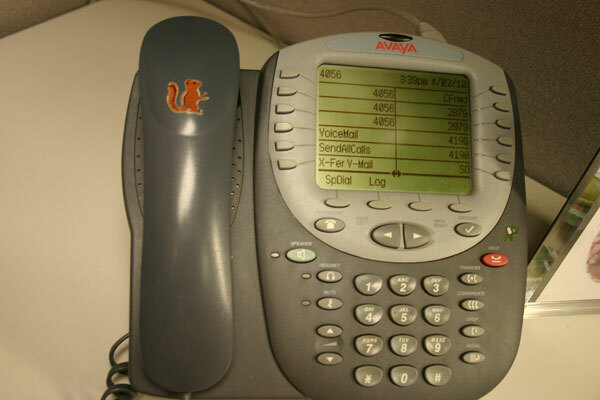 The sticker on the handset is a little left-over tidbit from Tammy. Interestingly, Jessica is horribly afraid of squirrels. One of the most interesting things about working in an art museum is acquiring left-over pieces of previously installed exhibition detritus. 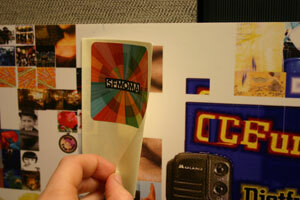 This poster is a section of c a l c and Johannes Gees’s communimage work from the Art of Participation exhibition. 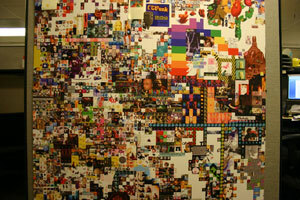 The work allows people to upload pictures to an ever-expanding sea of images, which are then installed on gallery walls for temporary exhibitions. 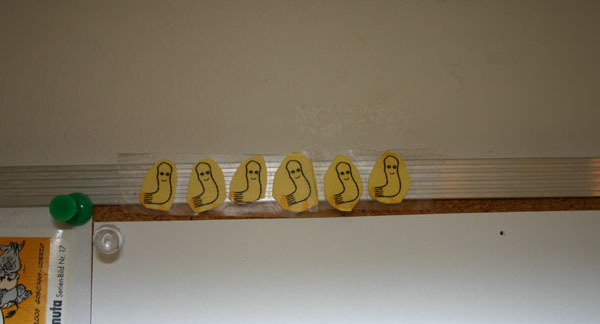 After Jeanette Woodburn, development associate for the Director’s Circle, installed this fragment on her workstation wall, she added modesty flaps to cover the more dirty contributions. 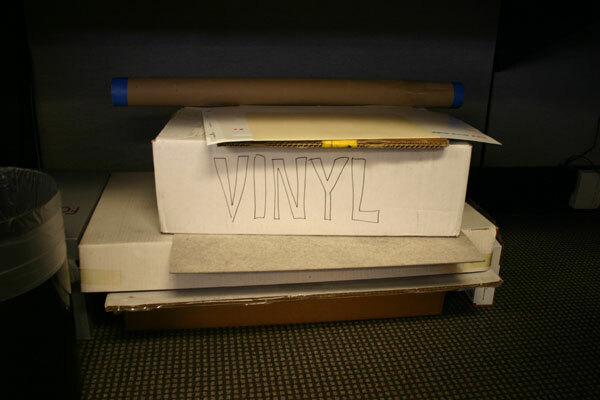 James Williams, senior graphic designer, has his own “vinyl collection” under his desk. 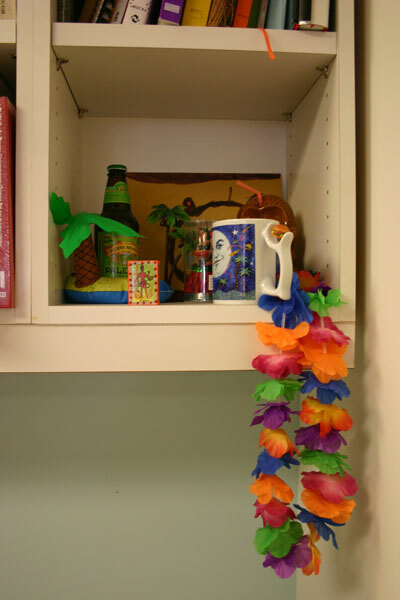 Chad Coerver, graphic design and publications director, maintains his own personal Tiki Corner in his office. 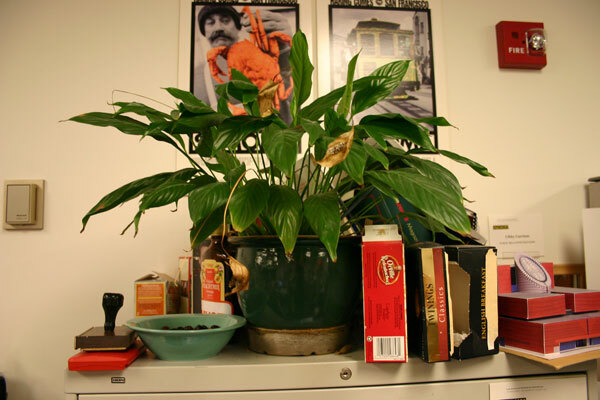 Libby Garrison and Caitlin Moneypenny-Johnston of the marketing and communications department keep this plant—a.k.a Chelsea—alive. Chelsea has been with SFMOMA for 20 years and while she has seen both museum buildings (the Van Ness location and 3rd Street) she has never seen real sunlight. She likes it that way. 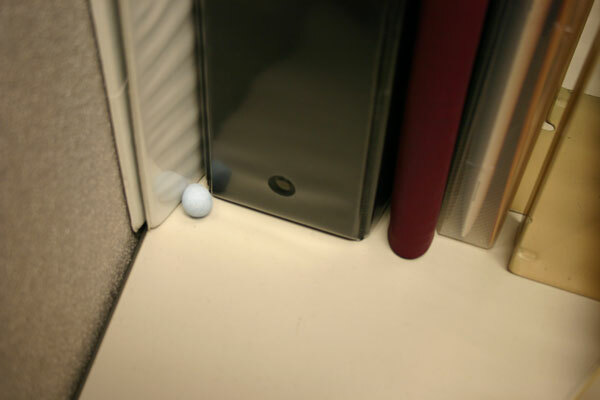 Jessica Brier, administrative assistant to the photography department and Foto Forum coordinator, finds chocolate Easter eggs around her cube. A mischievous curator of photography hides them for her. Charmmie Park, the visitor services supervisor, collects these ticket ghosts. They appear anytime a test admission ticket is printed. Officially, they indicate when a ticket is printed as a test and is therefore invalid. She just likes ’em because they are so darn cute. 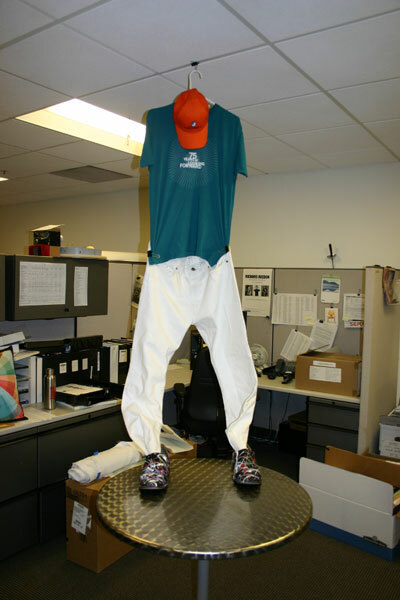 Ian Padgham, voice of the museum’s Twitter and Facebook pages, keeps this outfit at his desk. Notice the Pollock-inspired shoes, the business casual white jeans, the SFMOMA 75th Anniversary teal t-shirt, and the orange SFMOMA hat. It’s a lot of look, but Ian can pull it off. Megan Brian is the education and public programs coordinator at SFMOMA. You can see her Visitor Flickr Pic of the Week and 5 Questions columns here on Open Space. 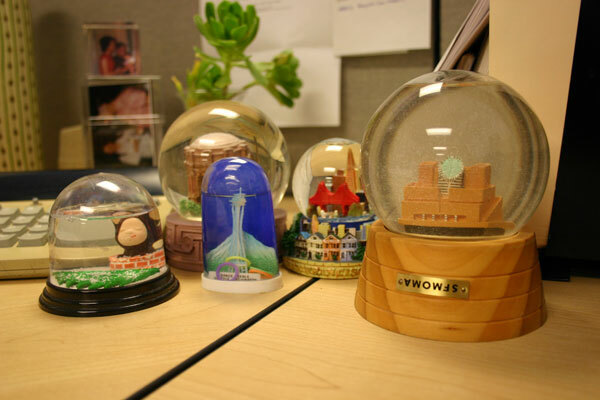 She also collects random and sentimental things on her desk. 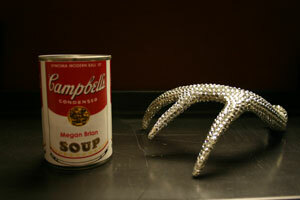 At the left, her personalized soup can from SFMOMA’s 2008 Modern Ball, and a bedazzling antler.